I know this is late, (like, embarrassingly so) but 2014 was such a crazy, fun-filled, amazing year that I still feel like I owe it homage in some way. Doing the "Photo of the Day" project also means by the end of the year, I'm left with so many photos that I love and that capture the day-to-day beautifully that I can't stand just having them disappear into my computer for eternity. A selfie with a view: an amazing rooftop bar in Vegas with my Love. I loved this photo of our drive in North Dakota. Frigid cold and a lone tree dead-set on survival. Roller Derby chicks are hard-core! Fur Rondy time is one of my favorite "Holidays". This was the first year that I rocked fur at Rondy. This will always be a favorite photo of Tony & me. We hiked to Portage Glacier and were rewarded with this epic shot from Mother Nature. I love this portrait of my friend, Carly. All of the utensils were missing from the work kitchen, so Carly scrounged a knife to eat her yogurt. The look on Reba's face in this photo-- even while her puppy, Kobuk, tries to bite her is pure joy. I love this shot. Puppy-sitting was so much fun. Especially because Kobuk was enthralled with anything and everything our dog, Ruger, did. I loved this shot of them staring at each other. Mandi & Aaron cutting the cake: The Series. North Dakota wedding on the plains. I love this shot so much... it was the highlight of my morning after the wedding. Room service, caramel sticky buns that reminded me of my Grandparent's farm, and a bouquet of stunning flowers. Every once in awhile I capture a shot of my Mom where she looks like she does in photos of her as a little girl. This is one of those times where she looks like she's seven... Who gave the seven-year old a huge Bloody Mary?! Tony often tires Ruger out by chucking Lacrosse balls. This was one of those epic nights with golden light, only Alaska in the spring can offer. We love riding in the Ranger. Kenny made it official: he changed from Iowa plates to an Alaska one. I love capturing small milestones like this. Tony proposed to me on May 23, 2014. I spent the next 48 hours just staring at this stunning ring. I think I probably took over 200 photos of it on and off my hand in that span of time too. Wild fires can do crazy things to the sky. As the Funny River Fire blazed on south of Anchorage, everything smelled like campfire and the sun was a constant red dot. One of my favorite photographers, Brandon Hafer, took some "Save the Date" photos for us this summer. This one was my favorite, because it was so us. You can't beat Alaska's flora and fauna... they just scream for macro shots. Fireworks over McCarthy on the 4th of July. Bluberry Hill is my favorite place in the world, and the reason I picked the name for my business. I took this photo of my sister walking down the street in Portland. Don't know why it speaks to me, but I love this shot. At the time I took this, we were preparing for winter... A winter that still hasn't really shown up yet. I love the quintessential Alaska look with this picture though. Tony and I got into dehydrating this fall. Alaska has so much bounty to offer. This was a batch of caribou jerky, but we also did several batches of mushrooms and berry fruit-leather. Forcing myself to take at least one photo a day means I often take pictures of trivial little moments that most people wouldn't think to capture. Delainey laughing at work was one of those adorable moments that I see 40 hours a week and don't always take the time to appreciate. Shopping for Bridesmaid dresses with my Mom and Sisters was such a meaningful time. I took this shot while Mom and I were anxiously awaiting their grant reveal. I had my fair share of health problems in 2014. This little project was a nice diversion... I propped the camera up on a Kleenex box and used a timer to get the shot. I screamed in the middle of the night when I looked out the window and saw this. (I'm pretty sure Tony thought we were being robbed.) I jumped out of bed, grabbed my gear, and was lucky enough to take this picture less than 100 yards from my home. Tony and Ruger silhouetted against the mountains atop Mt. Baldy. That gold headband makes me feel like a "khaleesi"... Had to take a self-portrait to show my power. 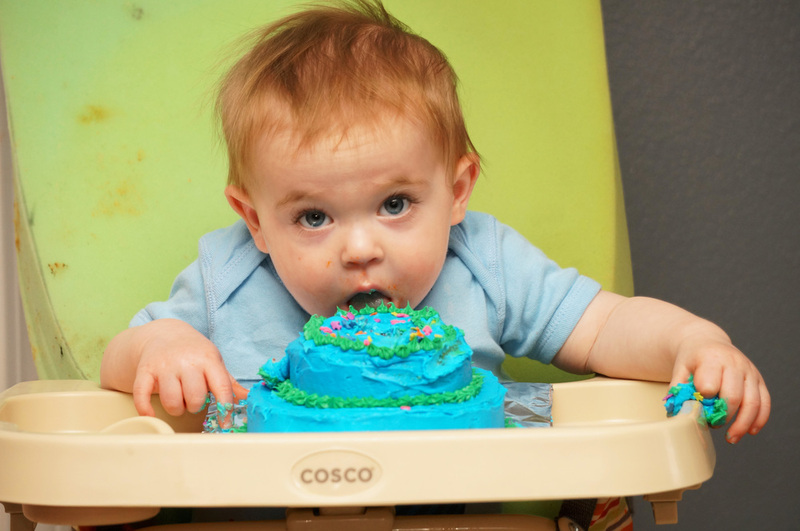 Kruz on his first birthday. He's one of the cutest kids I've ever seen and I feel so lucky that I get to take pics of him frequently. Decorating Mother Nature...I used battery-operated lights to "spruce up" a wild Christmas Tree. My friend, Beth, and amazing seamstress has helped so much with the wedding decorations. Look at all of that bunting she's made! The end of the year always comes with a focus on intentions. Releasing a lantern to the universe.